The sequel to one of the best looking games of all time has arrived, and this time it's gracing the consoles as well as the PC. The original game looked better than some of the latest games, and that was over 3 years ago. So how can the consoles handle the even better looking sequel? Starting as a marine, you find yourself en route to New York, on what you think is a standard mission. Suddenly, your submarine is attacked, breaching the hull and rapidly flooding the vessel. In a scene very similar to the opening of Bioshock, you then swim to the surface of the Hudson River, confronted with a heavily damaged Lady Liberty and some not so friendly aliens. And that's the intro, five minutes in and so much has happened, and it's nothing short of spectacular. The visuals, the audio, the amazing original orchestral score, all work together to make Crysis 2 one of the most cinematic games in a long time. The cut scenes are all worth watching, as you learn the backstory of characters, get hints on where to go and what to do, and generally see something incredible. The gameplay is classic Crysis, only better. Optimised for the console controllers, it is easy to get used to all of the commands, despite the vast amount of them. The nanosuit powers each have their own button, instead of the old selection wheel which really slowed down combat. The powers in question are really fun, and can really shake up the way you play. 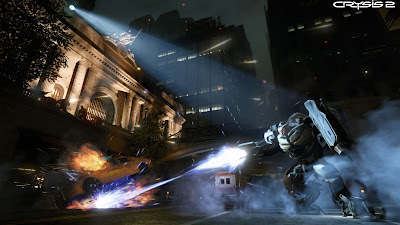 Have no powers active and play Crysis 2 like a normal FPS, in and out of cover, shooting small bursts. Activate your armour and you can stride into the middle of the battlefield, taking a lot more hits than usual. If you want to do the exact opposite, activate your cloak and sneak around undetected, using stealth kills to snap necks without getting too much attention. Each mode does need you to be careful, as the energy powering each ability slowly drains, and you can go from king of the battlefield to sitting duck within seconds. What's great about Crysis 2 is the customisability of both the nanosuit and the weapons. For killing certain enemies, you earn Nano Catalysts which allow you to upgrade your suit in a variety of ways. There are twelve upgrades to unlock, ranging from a hundred to thousands of catalysts. They can drastically change the way you play and really open up the tactics of the game. The weapon upgrades are more conventional but still very cool, and just like the suit upgrades, they each work in different situations. Attach a silencer and laser sight if you prefer a stealthy approach, or go with the iron sights if you fancy the run and gun method. The main talking point of the Crysis series is the visuals. 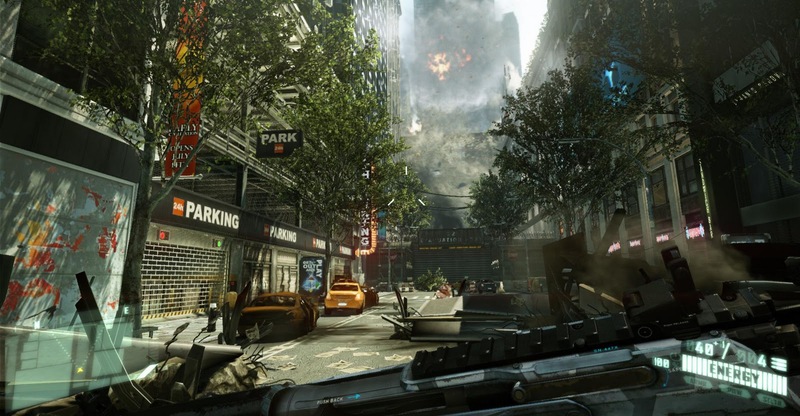 The graphics on Crysis 2 are spectacular, there are literally no flaws in that department. Even on the Xbox 360, the city is breathtaking, the graphics are clearly the best that the console has ever seen. The characters faces are so realistic, the city is sharp and detailed, the effects are top quality. Obviously the graphics will be even better, but Crytek have set the new standard for visuals on home consoles, and have proven that the 360 can in fact run games that look this good. The multiplayer aspect of Crysis 2 is really fun. A whole bunch of people fighting, all with the nanosuit powers can get pretty intense and really shakes up the usual FPS multiplayer formula. Instead of just levelling up, you also level up different aspects of your suit, which is a great feature. If you like to use the cloak, your cloak will level up and get much better. And it's the same with the power and armour. It's definitely worth trying out, but it can take a while to get used to. 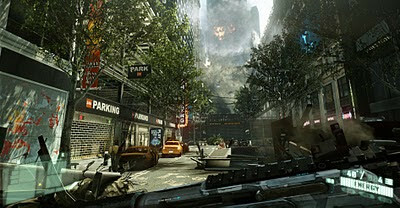 Crysis 2 looks amazing, there's no doubting that. That gameplay is intense, incredibly fun and the different approaches to each situation gives every player the experience that they want. If you're an FPS player, Crysis 2 is a must have. It will blow your mind.